We cross the wild countryside of Antigua by coach in the direction of our base, in the village of Seaton's. Here we meet our local instructor who welcomes us and provides us with the equipment we need for snorkeling. After a short safety briefing and explanation on the use of the equipment we board a boat and we are off for an exciting trip to Stingray (the "ray village"). When we reach our destination, we disembark onto a floating platform* from which we dive into the water. The warm waters between the beach and the coral reef reach a maximum depth of about 1.5 metres; an ideal depth for observing the fantastic creatures that live under the surface of the sea. The transparent waters make this experience even more spectacular. Guided by a local instructor we learn all about how friendly the rays are as we watch them while they perform their aquatic acrobatics, winding around our legs and at times even coming up to the surface to be stroked and let us take pictures of them. 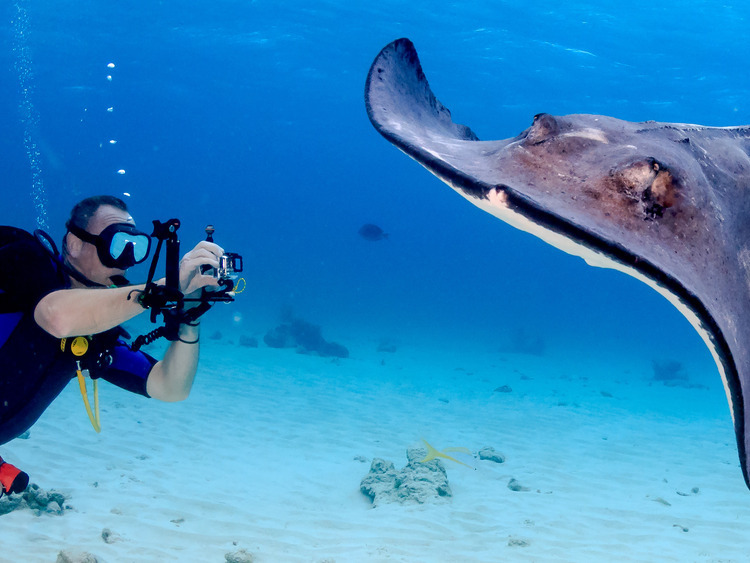 The more daring participants can even feed the rays with small squids following the instructor's indications. It is quite a unique and exciting experience that will leave an indelible mark in our memory.